HAMPSHIRE'S NEW RING OF TEN. BARRON BELL TRUST GIFT TO SOUTHAMPTON. The Winchester and Portsmouth Diocesan Guild received a valuable addition to the bells in its area on Saturday, when the dedication of two trebles at St. Mary's Church, Southampton, gave Hampshire another ring of ten. Since Christchurch Priory Church was raised to the dignity of a twelve-bell tower, the county has had only one peal of ten, created when two trebles were installed at North Stoneham, and constituting the lightest ring of this number in any church in the country. The augmentation at St. Mary's, Southampton has resulted in a magnificent peal. The octave was installed a few years ago by Messrs. Taylor and Co., who have now carried out the addition, and bells form a very fine ring, with a tenor of 22 cwt. 1 qr, in E flat. The dedication was combined with the annual meeting of the Southampton District of the Winchester and Portsmouth Diocesan Guild, and over 100 ringers were present from towers in the area and places as far apart as London, Oxford and Swanage. 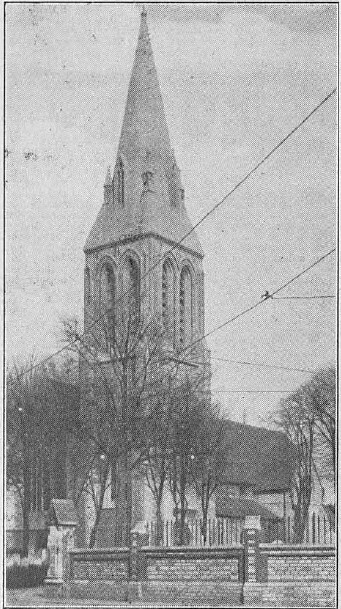 The service opened with the hymn, "O Praise ye the Lord," followed by Psalms 122 and 150, the Magnificat, lessons, etc., and during the singing of the ringers' hymn, "Lifted high within the steeple," the procession, which included the local ringers, Mr. G. Williams (Master of the Guild) and several well-known Winchester Guild officials, proceeded to the tower, where they were met by Mr. F. Hopkins, who, on behalf of Emma Barron Bell Trust, presented to Canon R. B. Jolly the two new bells, and requested him to dedicate them to the glory of Almighty God. The Rector having offered the customary prayers, a few well-struck rounds were rang by the local band, while the procession returned to the chancel. An inspiring sermon was preached by Rev. F. Llewellyn Edwards, hon. secretary of the Salisbury Diocesan Guild, whose text was Numbers x., 1, 2 and 10. His discourse was very much enjoyed and appreciated by all present. The service closed with the singing of the hymn, "Unchanging God, Who livest." Immediately after the service was over a well-struck touch of Grandsire Caters was rung by nine officers of the Winchester and Portsmouth Guild and the Rev. F. Ll. Edwards. A large number sat down to tea in the Chantry Hall, presided over by Canon R. B. Jolly, and supported by a number of local clergy. At the close of the tea Canon Jolly expressed the grateful thanks of himself and parish to the trustees of the Barron Bell Trust for their gift to Southampton, and Mr. F. W. Rogers (hon. secretary) expressed the thanks of the Guild.- Mr. F. Hopkins replied for the Barron Bell Trust, and Mr. J. P. Fidler, who represented the bell founders, amused the company with one of his usual stories. At the business meeting of the Southampton District the usual routine subjects were dealt with. The Secretary reported steady progress during the year, and said that the bands at Fawley and Lockerley had joined. Canon C. P. Clarke was elected an hon. member, and sixteen new ringing members were elected. It was decided to hold the next annual meeting at Southampton on January 12th, 1935, and quarterly meetings at Lockerley, Dibden and Fawley. The district officers were all re-elected. Afterwards, throughout the evening, touches in various methods up to Cambridge Surprise Royal were rung on the bells at St. Mary's and St. Michael's Churches.